Here’s an easy-to-make and delicious-to-eat appetizer recipe for bacon wrapped onion rings that’s sure to please. I mean, who doesn’t love bacon? And of course, onions are healthy, so that balances out with the bacon, right? If you haven’t heard about Sriracha sauce yet, it’s a fiery hot type of hot sauce or chili sauce made from a paste of chili peppers, distilled vinegar, garlic, sugar, and salt. They say it originated in Thailand, and is also used in much of Vietnam and Asia. Besides being a popular dipping sauce, it’s been used in soups, eggs, burgers, jams, lollipops, and cocktails. Pringles has even made a sriracha-flavored potato chip. It is being used in recipes at Applebee’s, P.F. Chang’s, Taco Bell, Pizza Hut, Jack in the Box, Subway, White Castle and Gordon Biersch, to name a few. We do love our hot sauces, don’t we? Bacon Wrapped Onion Rings with Sriracha Mayo Dipping Sauce – An easy to make and delicious to eat appetizer recipe for bacon wrapped onion rings. – Bacon, Sweet Onions, Black Pepper, Sriracha Hot Sauce, Mayonnaise, Lime Juice, To make the Bacon Wrapped Onion Rings:: Cut onions into 1 inch thick rings and pop the internal rings out until you have a nice sturdy onion ring. ; Brush onion with hot sauce. ; Wrap each onion ring with bacon and secure with a skewer or toothpick. ; Heavily cover the onion rings with pepper and smoke, grill or bake for about 90 minutes at 250-350 degrees. ; To make the spicy sriracha mayo:: Combine the mayonnaise, lime juice, and 1 Tablespoon of Sriracha sauce. Mix well. ; – Our thanks to www.grilling24x7.com for this recipe! 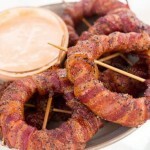 An easy to make and delicious to eat appetizer recipe for bacon wrapped onion rings. Cut onions into 1 inch thick rings and pop the internal rings out until you have a nice sturdy onion ring. Brush onion with hot sauce. Wrap each onion ring with bacon and secure with a skewer or toothpick. Combine the mayonnaise, lime juice, and 1 Tablespoon of Sriracha sauce. Mix well. Our thanks to www.grilling24x7.com for this recipe!